Lactobacillus reuteri is one of many species of Lactobacillus known to produce both L(+)-lactic acid and D(-)-lactic acid through normal sugar fermentation. As part of a prospective study of decreasing the risk of allergy during the first years of life, a safety investigation was performed of the levels of D(-)-lactic acid in the blood at the age of 6 and 12 months. A sample group of 24 infants were randomly chosen from the total study population of 232 infants. They had been supplemented with Lactobacillus reuteri ATCC 55730, or placebo, for twelve months from birth. The daily dose of Lactobacillus reuteri was 10^8 CFU, suspended in oil. 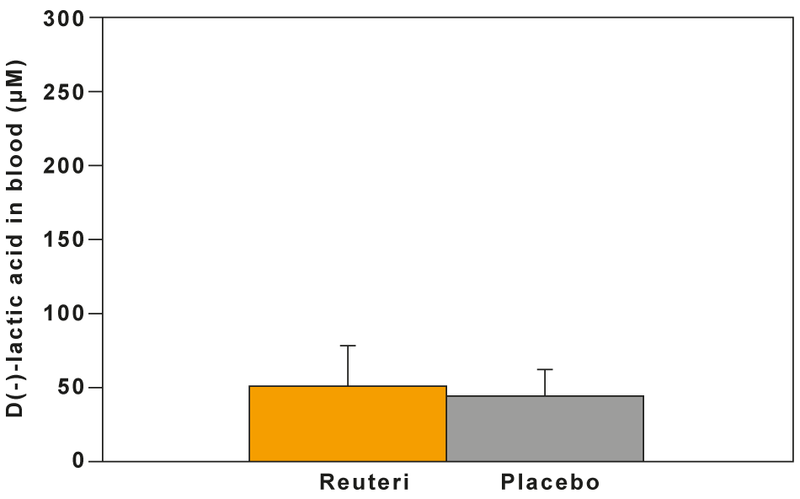 14 infants were supplemented with Lactobacillus reuteri and 10 with placebo. All 24 infants had very low levels of D(-) lactic acid (range 0.020 – 0.130 mmol/L), and there was no difference between the infants ingesting Lactobacillus reuteri and those receiving placebo. The highest level observed was well within the normal range seen in humans (0.020 – 0.250 mmol/L) and far below levels associated with D-lactic acidosis in humans (> 3 mmol/L). No symptoms were reported that would normally be associated with acidosis, and there were no safety problems in any of the participating children. Conclusion: The daily supplementation of Lactobacillus reuteri to healthy newborns during their first 12 months was safe, also in regard to the levels of D(-)-lactic acid in the blood. Safety of D(-)-lactic acid producing bacteria in the human infant. Connolly E, Abrahamsson T, Björkstén B. J Pediatr Gastroenterol Nutr 2005;41:489-492.